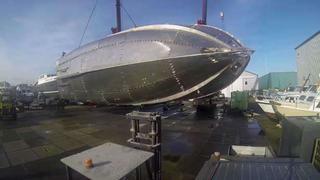 Wim van der Valk has released a timelapse video showing the first 24-metre Continental Trawler Yacht in build and the hull being turned in bright sunshine at the yard’s factory near Waalwijk in The Netherlands. Boat International reported in January on Wim van der Valk beginning construction of the first 24 metre Continental Trawler yacht and it’s clear the project has been progressing well. The aluminium hull, gleaming in the winter sunlight, has been completed and the plates are visible prior to any coating being applied. The video shows the hull being lifted on its side and swivelled round before being laid down on chocks for the yard to continue work on the superstructure and flybridge deck. The video below makes clear the round-bilged hull design, too, which has a draft of 1.8 metres. The 24 metre flybridge yacht is the first of a new series of semi-custom Continental Trawler Yachts available in different sizes. The new range was launched due to customer demand for a superyacht-size long-distance passagemaker in the trawler style. The interior and technical specifications will be fit for long-term cruising, while the hull will have the ability to stand up to hostile sea conditions as well as explore relatively shallow areas inshore. Beam overall is 6.8 metres. Wim van der Valk Trawler 2395 Timelapse turning the hull from Wim van der Valk on Vimeo. The Fast Displacement version of the trawler will be able to reach 18 knots with two 1,200hp MAN engines, the builder predicts. Guido de Groot Design is responsible for the trawler’s exterior design, while Ginton Naval Architects has taken care of the majority of the engineering disciplines.